In the event of a collision, the DrivePro's motion G-Sensor will detect an impact and instantly trigger Emergency Recording mode. This adds write protection to the affected recording, including the critical seconds before the accident, preventing this crucial information from being overwritten. If situations occur outside the vehicle which may provide important information in the event of a claim or lawsuit, press the accessible emergency button to manually activate emergency recording. Transcend's DrivePro 200 is bundled with a Transcend High Endurance memory card built with top-tier MLC NAND flash chips, providing consistent long-life durability and endurance. DrivePro™ 200 Day or night, the DrivePro 200 dashcam is a dependable eyewitness on the road. The DrivePro 200's 7 high-quality wide angle glass lenses capture crystal-clear Full HD video for display on a bright 2.4" color LCD screen for live view and playback, making it easier than ever to gather reliable evidence and examine events. Easy to install and operate, the DrivePro 200 includes wireless smartphone connectivity to let you stream, download, and share videos. Protecting you day and night Featuring a large ƒ/2.0 aperture, the DrivePro's high-quality camera lens will automatically adjust to light conditions to capture all details of an event, including license plates, both day and night. Innovative lens design 7 glass lenses plus 1 infrared filter lens prevent fogging from heat generated after a long period of recording. 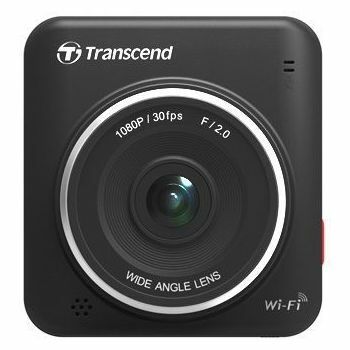 Capture the whole scene The DrivePro's camera combines an extra wide 160° viewing angle, resolution of 1920x1080p (30fps), and a row of 7 glass lenses to ensure your trip is recorded in high clarity. Record every critical moment In the event of a collision, the DrivePro's motion G-Sensor will detect an impact and instantly trigger Emergency Recording mode. This adds write protection to the affected recording, including the critical seconds before the accident, preventing this crucial information from being overwritten. If situations occur outside the vehicle which may provide important information in the event of a claim or lawsuit, press the accessible emergency button to manually activate emergency recording. Instantly view and download videos on mobile devices Supported by the free downloadable DrivePro App for Apple iOS and Android devices, the DrivePro includes wireless smartphone connectivity to let you stream, download, and share videos whenever needed – perfect for reporting incidents to insurance companies or police. MLC-based microSD card included Transcend's DrivePro 200 is bundled with a Transcend High Endurance memory card built with top-tier MLC NAND flash chips, providing consistent long-life durability and endurance. Two car mounts for selection The DrivePro 200 can be mounted with either the suction mount or the adhesive mount. You can purchase either of the package according to your personal preference.